This charming apartment on the last level of a small condominium, facing south east, is located in the historical and pitoresque area of Suquet. It enjoys a panoramic view of the bay of Cannes; from the old harbor to the Palm Beach from its loggia welcoming the dining area. Its equipped kitchen allows you to have breakfast with the view of the Esterel massif. The bedrooms each have a bathroom or a shower room with toilet. The apartment has individual air conditioning per room (living rooms). 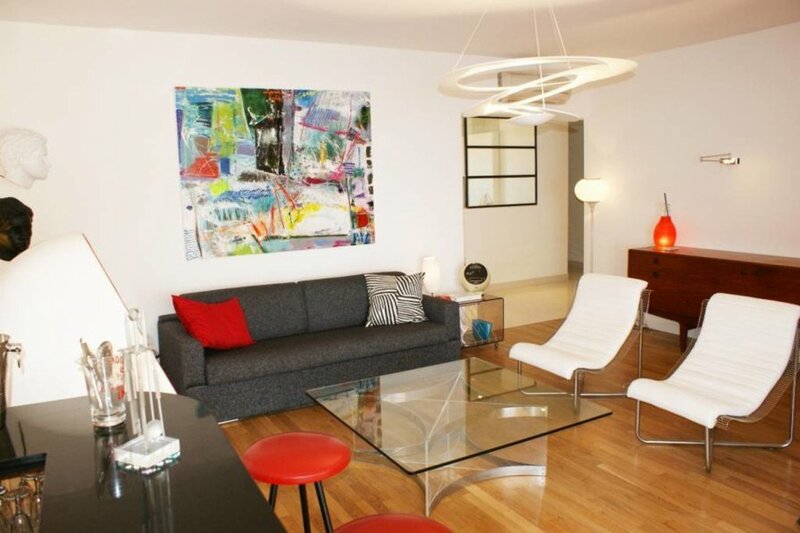 It has been recently renovated and benefits from a modern and neat decoration. The rooms are of pleasant surface with a nice height under ceiling. A quick access by elevator allows him to reach very quickly the Palais des Festivals, the beaches of the south at less than 100 meters, the old port at 300 meters. The city center and the forville market (rue d 'Antibes, the main street of Cannes which hosts a multitude of shops.) Is 400 m.
It is possible to benefit from residential parking in the street on request and with supplement. This apartment can comfortably accommodate 6 people, The 2 bedrooms can be configured as double bed or 2 single beds and the living room has a very good sofa bed 160cm. We can eventually add an extra bed or cot in the big room (on request and with extra charge).